6,000% growth in last 9 months. Zaif Exchange, a Japanese cryptocurrency exchange, today announced that it has added another currency into its trading platform. 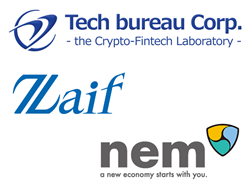 The cryptocurrency - XEM – has seen a meteoric rise in its value in the last 2 weeks, and it is timely that this is now added into the Zaif trading platform. XEM is the cryptocurrency of the NEM blockchain platform. At the time of this press release, the XEM market cap is 95.4 million USD at coinmarketcap.com.